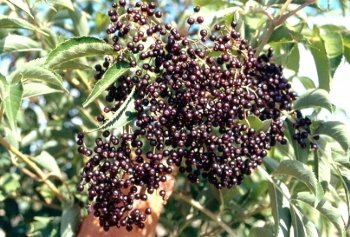 AMERICAN ELDERBERRY - a medium to large multi-stemmed, open, spreading shrub reaching 6 to 10 feet in height and spread, may lightly sucker to form open colonies. 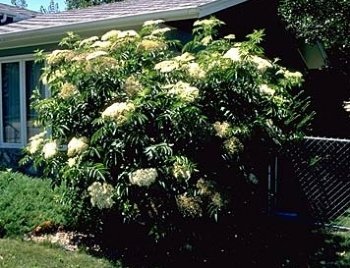 Large, white flower clusters are followed by purple-black fruits in late summer which are utilized by birds. Elderberry is a valuable wildlife plant occurring throughout the eastern and midwestern U. S. to the central plains states. Needs 2 plants to pollinate.